Top 3 Reasons to Make Lots of Soup, Stew and Chili this Winter! First, you can take one evening to make a huge batch and have leftovers for days. Soups, stews, and chilies just get better and better each day! This makes these dishes the perfect meal for women on the go… spend some time on Sunday making chili and you’ll have a fast meal all week long! Second, they’re super hydrating! In the winter, people often forget to drink enough water. Soup has a lot of water so it does double duty by quenching your thirst and hunger at once. The other good thing about hydrating soups is that you fill up faster! The water in these dishes helps your stomach feel full so that you are satisfied with less calories. This is a great trick for keeping your weight at a healthy level. Third, dishes like stews are health and wallet friendly! Soups and stews have lots of vegetables, beans and grains that pack a big nutritional punch and are not expensive to buy. The other way soups stretch your dollar is by making protein go further. Meat is usually the most expensive part of the meal, but since you need less meat to make a hearty serving of chili or stew, you can do more with less! There are also a ton of amazing vegetarian soup options out there, like the Hearty Greens Soup listed below! Below are a couple recipes I love. Just pick up some whole grain bread (or corn bread with the chili J) and some mixed greens for a salad and you’ll have a nutrient-packed meal ready in no time! 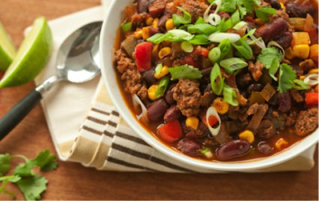 This flavorful turkey chili can easily be doubled and tastes even better the next day. It’s delicious served with cornbread from our bakery. Put a bottle of hot sauce on the table for those wanting extra heat. Per Serving: Serving size: , 440 calories (100 from fat), 11g total fat, 2g saturated fat, 65mg cholesterol, 774mg sodium, 56g carbohydrates, (10g dietary fiber, 9g sugar), 33g protein. 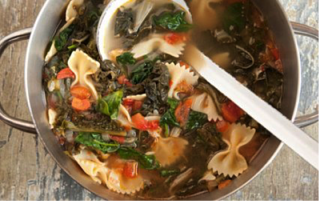 Use all manner of kale, chard or other hearty greens in this filling cold weather soup. Look for Parmigiano Reggiano rinds, ideal for flavoring soups and stews, in the specialty cheese department. Heat oil in a large pot over medium heat. Add garlic, onion, bay leaf, salt and pepper and cook, stirring often, until golden brown, about 15 minutes. Add tomatoes and cook until most of the liquid is released and absorbed, about 5 minutes more. Add carrots and 8 cups water and bring to a boil, scraping up any browned bits from the bottom of the pot. Stir in chard, escarole, pasta and Parmigiano-Reggiano rind. Reduce heat, cover and simmer until broth is flavorful and greens and pasta are tender, about 15 minutes. Stir in spinach and season with salt and pepper. Remove and discard bay leaf and cheese rind from soup then ladle into bowls, garnish with grated cheese and serve. Per Serving: Serving size: , 200 calories (45 from fat), 5g total fat, 1g saturated fat, 0mg cholesterol, 350mg sodium, 34g carbohydrates, (5g dietary fiber, 4g sugar), 7g protein. Kathleen Wood, leads the Healthy Eating Program at Whole Foods Market, for the Mid-Atlantic region. She graduated from Dickinson College and then did a Master’s degree in Public Health at Boston University where she focused on nutrition and theories of health behavior change. She also completed a certificate in plant-based nutrition from Cornell University. For more wellness tips and seasonal recipes please follow her page here! During all of my interactions, the staff has been friendly and helpful! What a great gym! Chang Yi and his staff are exceptional. I have been a member of this gym for over 10 years, you can definitely see a lot of new equipment, new staff, and new positive energy. I am beyond satisfied with the service I have received, the excellent new equipment, and the results I have achieved in such a small amount of time. During the past month I lost weight and dropped one dress size. There is a wide variety of machines and fitness tools to use throughout the facility and every time I have been in to workout it has been completely spotless. Looking forward to continuing to meet my fitness goals with this great company. This is a great gym with more than everything one needs in a gym! The equipment is good and the cardio area is bright and energetic. There is ample room for free weights and stretching. I have found the classes to all be excellent with very good instructors. And, an added bonus is free, available parking. This is a great place to work out and get fit! I've workout out here a couple of times and you are greeted with a smile the moment you arrive at the club! All the staff members are very helpful! The staff is friendly and helpful. The GM was great and helped me with my membership. overall, it's a great place to work out. Sport&Health is where I began my fitness journey over a year ago. Ever since joining I have felt 100% at home every time I walked through the front door. The staff, trainers, and management have been nothing but uplifting and accommodating and the renovations have only made the gym better. I would highly recommend this gym to anyone who is searching for a family,friendly atmosphere. You won't regret! The staff is so friendly and accommodating, and the gym is awesome. So clean with a wide range of equipment. Totally recommend! Excellent gym. Awesome classes as well as weight rooms and plenty of aerobic machines. Staff is exceptional. In love with the gym. Adorable environment, lovely and friendly staff that I have a big respect! Everything is organized and always cleaned!! Also great and professional trainers who are always ready to help you. Awesome place for family and friends. I enjoy every moment when I am there. Sport n health is my happy place! It's like my second home. The staff is friendly, approachable, knowledgeable and helpful. The upgrades to the equipment have been awesome and made my workouts fun and challenging. The vibe at sport n health is awesome. As a woman I feel comfortable and accepted and always am excited to walk into the club! Super-dedicated instructors, trainers, and staff! Administration and staff are so helpful and willing to talk to you and give you the time of day. Knowledgable and friendly!